Unless of course we get more snow. Another system will be coming through late next week. True, but I bet there was snow in May in some other years too... Anybody want to make their own prediction? And Yosemite just announced that the Bridal veil Campground is open for reservations starting August 1! Can we take random guesses, or do we have to be scientifical about it? So, aside from rockfalls, downed trees, sidings, etc., if we take out what they're doing from the east, we have about 45 miles to the east gate at Tioga Pass. As of the 27th, and assuming that they began on 04/15, they had plowed 14 miles from Crane Flat. Barring more snow and big problems, say maybe just slightly over a mile per day, then maybe throw in 10 days for touch up and problem areas. Even logistically, without historical averages (although there is a correlation), you're probably about right. For the sake of argument though, I'll go ahead and say 06/19. But really, from my perspective, it opens on whatever day I get there. Then the only problem left is being able to walk more than 100 feet off the shoulder without being at least up to your knees. Phil wrote: Can we take random guesses, or do we have to be scientifical about it? Just a bit of fun, so you can pin a calendar up and throw a dart at it if you want. If the page you're aiming at is June I have a feeling you've got as good a chance at being right as me. Slow going for the plows. As of the 3rd, they're only to White Wolf. Wet snow and only making 1/2 mile per day of progress. Do they clear only west to east? No crew coming in from the Lee Vining side? Must be at least 25 more miles to clear from White Wolf! I may be wrong, but I think that the Caltrans crews only plow from Lee Vining up to the gate at the Tioga Pass entrance station. And I believe that the NPS crews only work west to east with the park boundaries because of access problems from the east where they would have problems bringing in equipment because it's not stored there.They have a lot of avalanche zones, and the site said they were doing advance work at Olmstead Pt, so I'm sure they're throwing a lot of anfo satchels this year, because I doubt they're using Avalaunchers or artillery pieces. Yesterday at this time the AC was running, tonight it's the heat. Although we did have our first rattlesnake of the year about 2 hours ago. Things can change but May is supposed to be well above average temps. 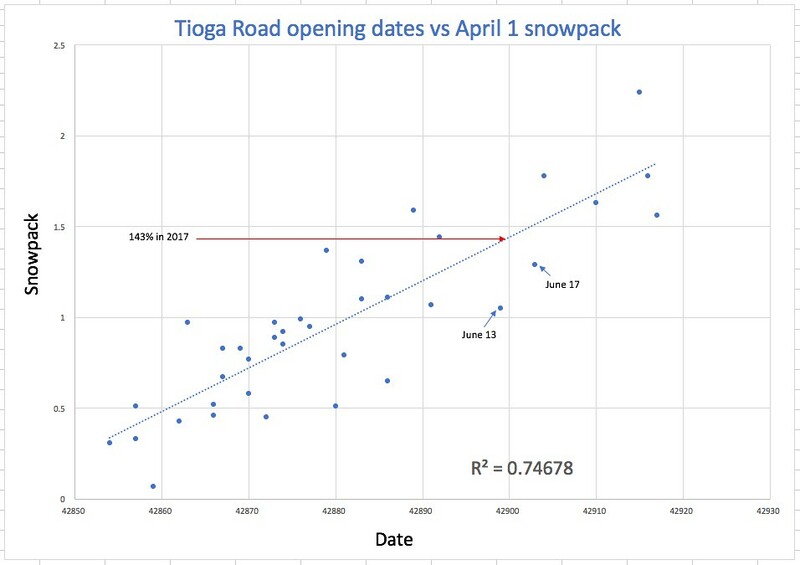 Also as everyone knows "wet snow" actually melts faster and your snow pack is significantly wetter this year. I'll guess June 9th. Only because they are plowing, not because the melt will be done. It's snowing this weekend on the pass, in the high country. 25 F predicted for Saturday night at 9000 feet. Looks like they went about 5 miles in 6 days (White Wolf on the 3rd, to near Yosemite Creek by May 9), so still a long way to go, but they seem to be speeding up a bit, he says hopefully.